Syed Rouhollah Mousavi Khomeini, who came to be known as Imam Khomeini was born in the small town of Khomein on September 24, 1902 coinciding with the auspicious birth anniversary of Fatima Zahra (PBUH), the daughter of the holy Prophet of Islam Mohammad (PBUH). His ancestors had migrated from the Iranian city of Neyshabour to Lucknow in northern India. His parental grandfather left Lucknow in 1830 on a pilgrimage to the tomb of Imam Ali in Najaf, where he met a prominent citizen of Khomein and moved there. Imam Khomeini’s father Seyyed Moustafa began his religious education in Isfahan and continued his studies in Najaf and Samarra. Losing his father when he was five months old, Rouhollah Khomeini was left in the care of his older brother, Seyyed Morteza, when his mother passed away in 1918. Coming from a family of scholars, the young Rouhollah began to study the Qur’an and elementary Persian at the age of six. He was then sent to the city of Arak (1920-21) to continue his religious studies under the leadership of Ayatollah Abdul Karim Haeri Yazdi. He then followed Ayatollah Haeri Yazdi to the Qom seminary in 1923 to continue his studies of Islamic law (Sharia), jurisprudence (fiqh), philosophy and mysticism. He pursued his interest in philosophy under the guidance of Mirza Ali Akbar Yazdi, Javad Aqa Maleki Tabrizi, Rafi'i Qazvini and Mirza Mohammad Ali Shahabadi. He was also influenced by Sufi mystics such as Mulla Sadra and Ibn Arabi. Ayatollah Khomeini was also interested in literature and poetry and his collection of mystic, political and social poetry was published posthumously. During the 1930's, Imam Khomeini did not engage in political activities, as he believed that the leading religious scholar of the time, Ayatollah Haeri, should have leadership of political activities. Instead, he dedicated his time to teaching Islamic jurisprudence in Qom, gathering around him students such as Ayatollahs Morteza Motahari and Akbar Hashemi-Rafsanjani and Hojjatoleslam Mohammad Bahonar, who would later become important figures in spreading his message and in the movement, which led to the fall of the Pahlavi dynasty. As a leading Shia scholar, he taught political philosophy, Islamic history and ethics focusing on the importance of religion in dealing with practical social and political issues of the day. Ayatollah Khomeini became a Shia Source of Emulation with the passing of Grand Ayatollah Boroujerdi in 1961 and gradually entered the political arena. When in 1962, the government enforced new election laws, which negated the former requirement for newly elected officials to be sworn into office on the holy Qur'an, Ayatollah Khomeini warned the Pahlavi monarch, Mohammad-Reza Shah, against violating the laws of Islam and the Iranian Constitution of 1907. He cautioned the second Pahlavi that such a move would only lead to a protest campaign headed by the clergy. Mohammad-Reza Shah announced his White Revolution program of reform in January 1963. The six-point program was an American-inspired package of measures designed to give the Pahlavi regime a liberal and progressive facade. Ayatollah Khomeini issued a declaration on January 22, 1963 denouncing the Shah and his reform plan. Imam Khomeini also issued a manifesto listing the various ways in which the Shah had violated the constitution. The manifesto that also bore the signatures of eight other senior scholars condemned the spread of moral corruption in the country, and accused the Shah of comprehensive submission to his American and Israeli masters. Imam Khomeini delivered a fiery speech at the Feyziyeh School of Islamic Studies on June 3, 1963, warning the Shah that if he did not change his ways the day would come when people would celebrate his departure from the country. Shah ordered his secret service, SAVAK, to arrest Imam Khomeini two days later and transfer him to the Qasr Prison in Tehran. Masses of angry demonstrators were confronted by tanks and paratroopers after the news of his arrest broke on June 3, in Qom, Tehran, Shiraz, Mashhad and Varamin. It took six days for the Pahlavi regime to restore order and the uprising marked a turning point in Iranian history. After nineteen days in the Qasr prison, Ayatollah Khomeini was moved first to the 'Eshratabad' military base and then to a house in Tehran where he was kept under surveillance. Imam Khomeini continued his anti-Pahlavi activities and delivered a speech to denounce the agreement with the United States that provided immunity from prosecution for all American personnel in Iran and their dependents. He said the agreement was a surrender of Iranian independence and sovereignty, made in exchange for a USD200 million loan that would be of benefit only to the Shah and his associates. He also called all parliament members who voted in favor of the agreement traitors saying that the government lacked legitimacy. Ayatollah Khomeini was again arrested on November 4, 1964, and taken directly to Tehran’s Mehrabad airport for immediate exile to Turkey. Imam Khomeini left Turkey for Najaf in Iraq on September 5, 1965 where he spent the next thirteen years of his life teaching fiqh. It was in Najaf that he delivered his famous lectures on Providence of the Jurist, the theory of governance and Islamic leadership. His exile, however, did not diminish Imam Khomeini’s religious and spiritual influence among the masses. In January 1978 a furious mass protest took place in Qom after an offensive article was published in the semi-official newspaper Ettelaat. The protest which was suppressed by the security forces was the first in a series of popular confrontations that turned into a vast revolutionary movement, demanding the overthrow of the Pahlavi regime and the installation of an Islamic government. Ayatollah Khomeini was informed that his continued residence in Iraq was contingent on his abandoning political activity, a condition he rejected. He left Iraq for Kuwait on October 3, but was refused entry at the border. Ayatollah Khomeini embarked for Paris after a period of hesitation and settled down in the suburb of Neauphle-le-Chateau in a house that had been rented for him by Iranian exiles in France. Journalists from all around the globe made their way to France, spreading the words of Ayatollah Khomeini in world media. Imam Khomeini refused to return to Iran until the Shah left the country on January 17, 1979. Two weeks later, he returned to Iran on a chartered Air France airliner on February 1, 1979 and was welcomed by a crowd of at least six million as estimated by ABC News reporter Peter Jennings, who was reporting the event from Tehran. He introduced Mehdi Bazargan as interim prime minister on February 5, and ordered defiance of the curfew on February 10. The Supreme Military Council withdrew its support from Shah’s appointed Prime Minister Shapour Bakhtiyar on the next day and Shah’s regime collapsed on February 12, 1979. A nationwide referendum held on March 30 and 31, 1979, resulted in a massive vote in favor of the establishment of an Islamic Republic and Ayatollah Khomeini proclaimed the next day, April 1, 1979, as the "first day of God's government". The founder of the Islamic Revolution, Ayatollah Khomeini, first settled in Qom but was brought to Tehran to receive heart treatment on January 23, 1980. After thirty-nine days in hospital, he settled in the north Tehran suburb of Darband, and on April 22 of the same year he moved into a modest house in Jamaran, from where he governed the country for the rest of his life. Ayatollah Khomeini passed away on June 3, 1989, eleven days after he was taken to hospital for an operation to stop internal bleeding in May 1989. 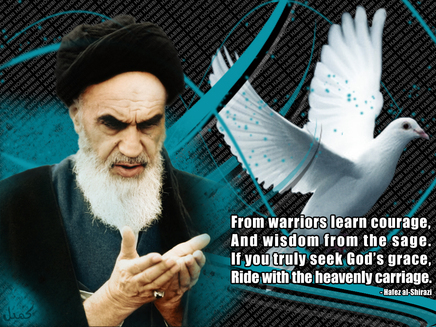 As the author of more than 40 books and religious preaching, Imam Khomeini’s ideology reached many across the world. Millions of mourners gather at the final resting place of the late Imam Khomeini to mark the anniversary of his demise every year. Iranians from across the country travel to the outskirts of the Iranian capital to be part of the commemoration ceremony at the mausoleum of the Founder of the Islamic Republic. Muslims around the world also hold ceremonies to uphold his call for supporting the oppressed and his efforts to end conflict among Muslims.